Mount Luvhola got its name from its peak which is shaped like a bee sting. A bee sting is known as luvholela in Tshivenda. From the word luvho(le)la came the name Luvhola. Luvhola and Luonde are the lands of the Mukwevho clan. Vhakwevho are a sub-group of Vhatavhatsindi and are some of the original inhabitants of Venda. Vhakwevho refer to themselves as Nguluvhe (warthogs). The Vhakwevho of Luonde are known as Nguluvhe Khulu (big warthogs), while those of Luvhola are referred to as Zwigwamtada (small warthogs). This is where the saying ‘Nguluvhe khulu dzi Luonde, Zwigwamtada zwi Luvhola’ came from. It means that the big warthogs are at Luonde, while the small ones are at Luvhola. Vhakwevho also said ‘Thavha khulu dzi a rendana. Luvhola yo renda Luonde (Big mountains praise each other. Luvhola praised Luonde).  To the north, north-east, and north-west of Luvhola there were other communities loyal to Makhado such as Tshitungulu, Tshifhefhe, Tshidzivhani, Tshivhodza, Marandela, Ramaite, etc. Communities such as Manavhela (Ramovha), Folovhodwe, Mamphodo, Mushasha, Begwa, which were south and south-west of Luvhola were also loyal to Makhado. Davhana was, therefore, completely surrounded by Mahosi loyal to King Makhado. These Mahosi were instructed to monitor Davhana’s activities and to guard against any possible attacks from Davhana. Venda-speaking communities were forcibly removed from Old Mpheni and Luvhola in 1966/67 to make way for a timber plantation. Vhavenda from villages around Mount Luvhola, known today as Chabani, Njakanjaka, Shirley, Lemana, Mbokota, etc were also forcibly removed in 1966/67. This was after these areas were, in terms of the apartheid’s Group Areas Act, declared Tsonga-Shangaan areas and incorporated into the newly created Gazankulu Bantustan. Mr William Sinugu, one of the senior members of Mpheni-Luvhola community who were forcibly removed from their land by the Boers in 1966/7. 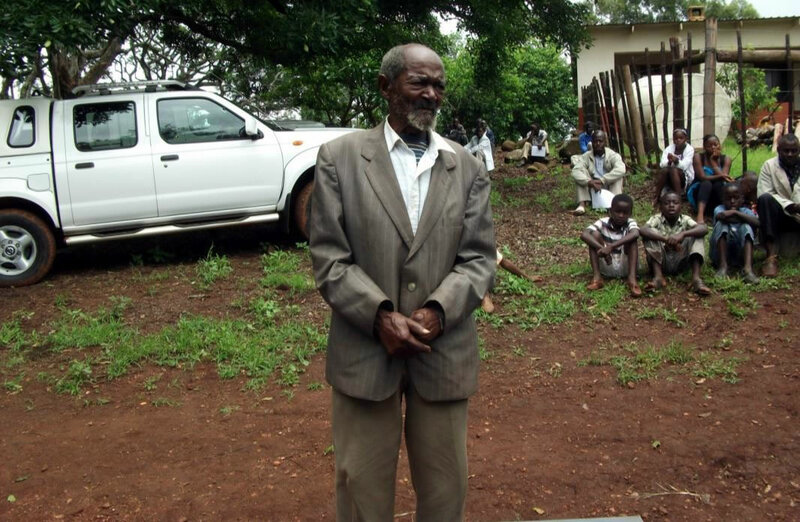 The photo was taken during the ceremony to unveil the tombstones of Davhana/Nesengani, Ramphaga and Mukwevho families on Mount Luvhola on 18th December 2010. Although Vhavenda were forcibly removed from Mpheni and Luvhola in 1966/67 to make way for a timber plantation, the Mukwevho and Davhana/Nesengani shrines and graves were not interfered with. The Mukwevho and Davhana/Nesengani clans were allowed to visit their shrines and graves and to perform religious rituals on Mount Luvhola. Everybody in the villages found at the foot of Mount Luvhola respected the shrines and graves on Mount Luvhola. Going anywhere next to the shrines was a taboo and people avoided the shrines. “Nga nwaha wa 77 Thavha ya Luvhola yo fhedza vhathu. Ha-Chabani Luvhola yo fhedza vhathu”. Although scientists believed that the mudslide happened as a result of heavy rains on Mount Luvhola, locals (both Venda and Tsonga-Shangaan speakers) believed that the disaster was the wrath of the ancestors. The homesteads that were destroyed were not rebuilt, and the ones that survived moved further south to avoid future disasters and to be as far away from the shrines as possible. Even today the Mukwevho and Davhana shrines on Mount Luvhola are highly respected and feared. The shrines are referred to by many people as fhethu ha Vhadzimu (place of the ancestors).